The High Court has placed an injunction on bio-engineering firm Piggytech Ltd. to prevent them from genetically engineering pork pies for breeding purposes. The move is a temporary measure, pending a full investigation into the company's activities. 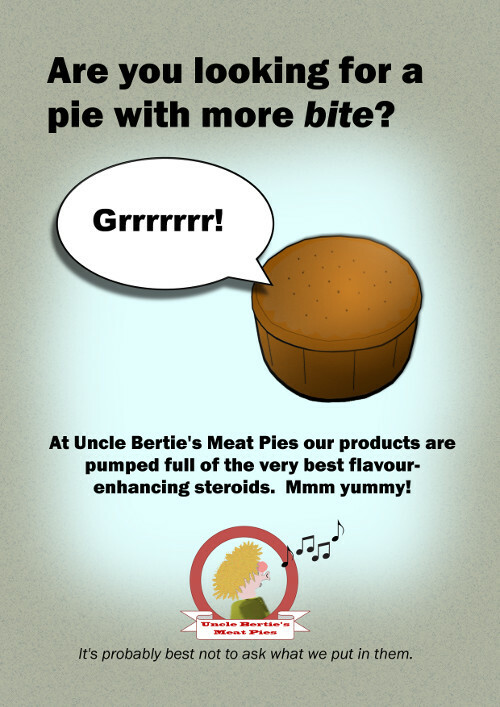 Piggytech supplies meat to a number of companies, including Uncle Bertie's Meat Pies and Giblet and Son's Reconstituted Ready Meals. The injunction follows complaints that Piggytech's scientists have been pumping sausage rolls full of testosterone to make them more aggressive. A number of people have already claimed to have been attacked by suspect products whilst doing their weekly shop, and there are reports that several tins of cocktail sausages have escaped from a supermarket in Arbroath and have turned feral. A spokesman for the company has tried to reassure the public, claiming that everything the company does is ultimately in the interests of the consumer. However, many people who attended a recent press conference were rather less reassured by the fact that Piggytech's spokesman appeared to be made entirely out of pork scratchings.